Happy personal income tax filing deadline day everyone! I know that doesn’t have quite the same ring to it as a real holiday or big event and you aren’t nearly as excited about it as we are. However Oregon is a personal income tax state; they make up 88% of the General Fund this biennium. Besides providing the bulk of state resources, tax returns also produce a wealth of data about Oregon households. This includes the basics about the number of taxpaying households, the sources of income, the growth of different types of income, and even migration patterns. But tax returns also produce more detailed data you cannot get from any other source, this includes things like usage (and amounts) for the various credits and deductions which can help policymakers evaluate, well, policy. Tax returns are also our only real source of information on capital gains, which swing wildly over the business cycle. So with all of this in mind, on this Tax Day 2018, let’s take a look at a few pieces of information that tax returns provide. First, let’s take a look at a breakdown of Oregon full year filers, that is taxpayers who lived in Oregon for the entire year. This is 2015 data, which is the most recent year for which complete data is readily available from the great personal income tax statistics report from our friends over in the Department of Revenue’s Research Section. 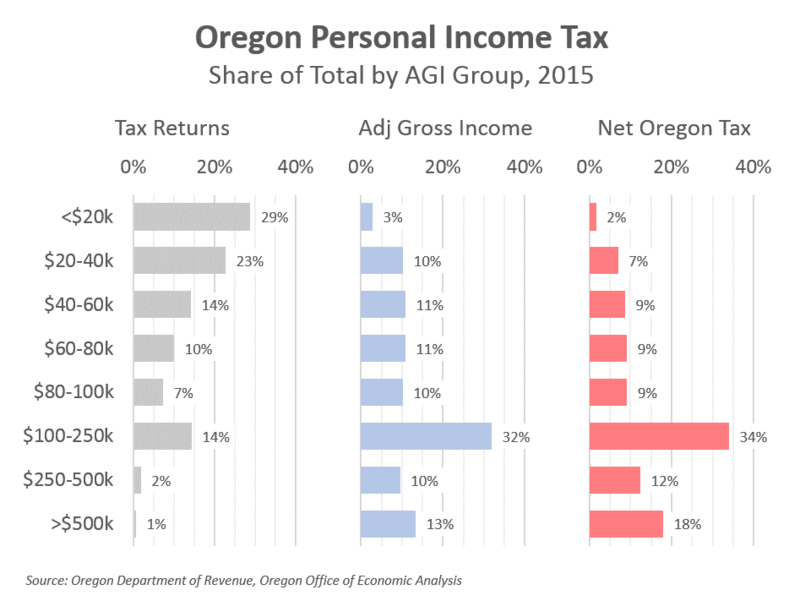 In the chart below you can see that just over half of taxpayers in Oregon – 52% – have adjusted gross incomes (AGI) of less than $40,000. In total, these 52% of households received 13% of all income that year, and paid 9% of all income taxes. On the opposite end of the spectrum, Oregon taxpayers with incomes above $250,000 accounted for 2.5% of all full year filers, they received 23% of all income, and given Oregon has some progressivity to its income tax, these households paid 30% of all income taxes. It’s not just the total amount of income and taxes paid that matter, but also the components of income or the different types of income. In fact in our office’s forecast work, we look at and forecast these various types of income separately given they have varying trends and drivers of growth. This second chart shows big picture trends in the past decade or so and comes directly from the DOR research report. 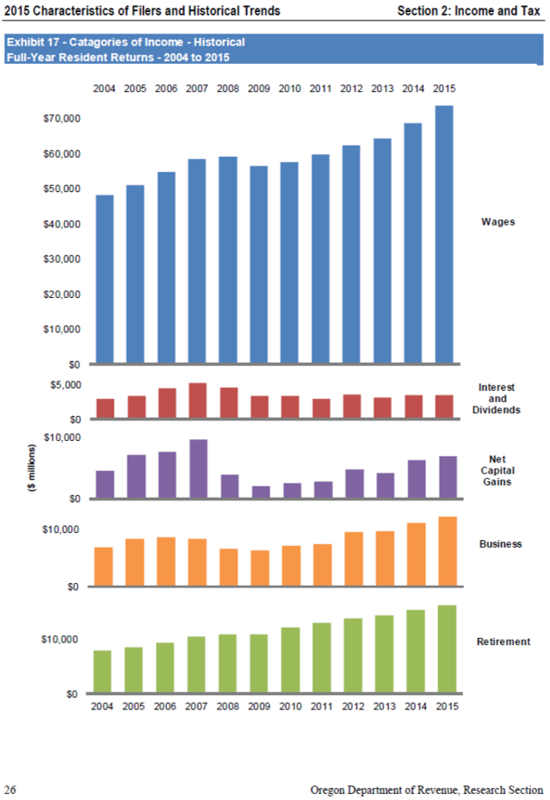 Here you can see both the trends over time and also the relative size of the income components. Wages are by far the largest source of income, and follow the labor market. Investment-related income, in particular capital gains, are the most volatile source due to asset market fluctuations and taxpayer behavior – the timing of when someone decides to sell. Retirement income fluctuates some, but is growing over time due to demographics and Baby Boomer retirements. Finally, I wanted to highlight two more things. One, the California Legislative Analyst’s Office (LAO) just put out a visual guide to California’s tax system. To be honest, it’s a great report that illustrates many key facts and trends about public revenues, and includes links to more detailed analyses for those interested in more. Two, the sources of income for taxpayers in different income brackets matters considerably in understanding incomes, volatility, and taxes paid. 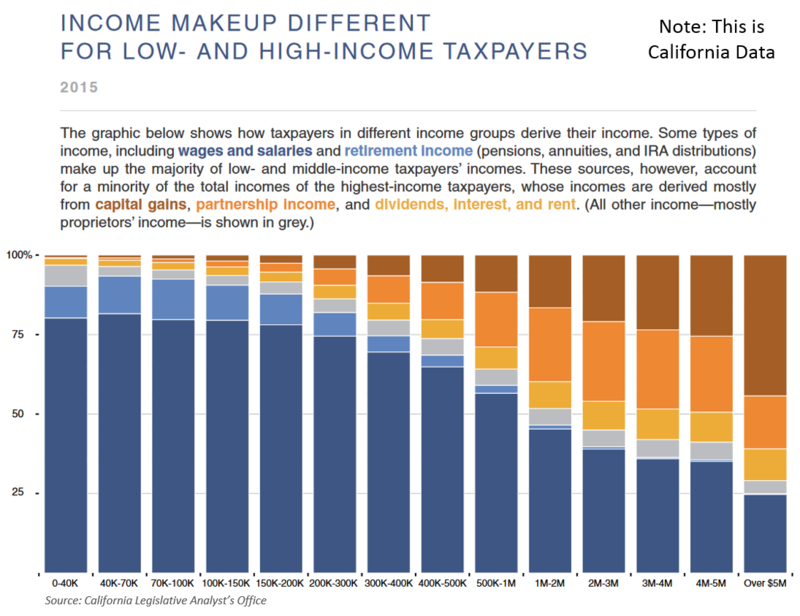 Our last chart comes from the LAO report and show this breakdown for California taxpayers. The combination of volatile revenue sources among the highest-income taxpayers, and some progressivity to income tax rates is what really drives the overall volatility of income tax revenues for the public sector. This, of course, is not entirely a bad outcome. There is a clear risk vs reward tradeoff between income taxes and sales taxes. Each has their benefits and their issues. In particular, what income taxes lose in stability, they gain in terms of equity (not being regressive) and also in avoiding the big tax base erosion problem that plagues general sales taxes. Bottom Line: Don’t forget to file your return today to avoid penalties. And by doing do, you will also help provide our office more information on the state of Oregon taxpayers and what policymakers can expect in terms of available resources as we work on the next economic and revenue forecast.